Freddy (Robert Englund) languishes in hell, forgotten by the kids of Springwood and actively suppressed by their parents. He concocts a plan to make everyone scared again, and lures Jason (Ken Kirzinger) to Springwood by posing has Jason’s mother. Although it’s initially successful, Jason is too good at killing and begins to steal not only Freddy’s prey, but also his notoriety, and thus stealing his power. A group of teens caught in between these two monsters, first have to uncover the legend of Freddy and Jason, and then try and pit them against each other at Crystal Lake. It took more than ten years for Freddy vs. Jason to appear after the promising coda of Jason Goes to Hell. There was a lot of expectation, and I think the film delivers for the most part. It juggles both the Elm Street and Friday the 13th back stories reasonably well. Once again, the relatively simple back story of Jason gets the most alteration here. Jason’s sudden fear of water isn’t really any more out of character that Freddy suddenly being a kung-fu expert who can mix it up with Jason in the real world. The back story of the lengths Springwood parents have gone to keep Freddy at bay is surprisingly thought out for what is effectively a modern day King Kong vs. Godzilla. The movie never forgets to be fun, we get to see Jason and Freddy work together and separately, and of course duke it out in the finale. 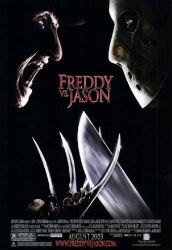 Freddy vs. Jason is a great monster mash-up, and it’s too bad they haven’t able to do it again.